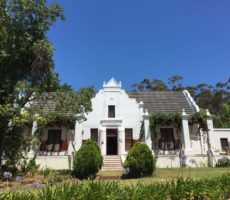 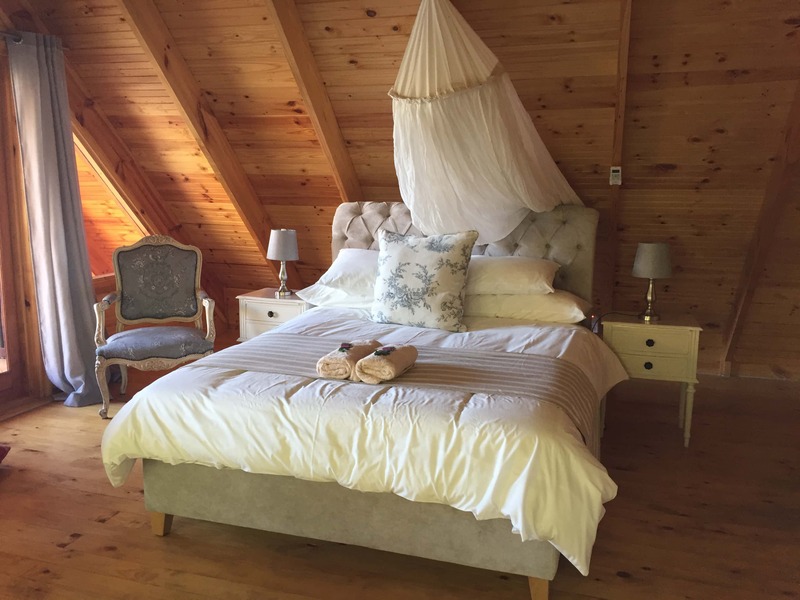 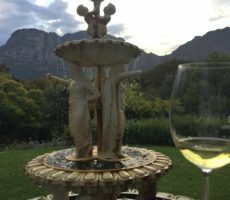 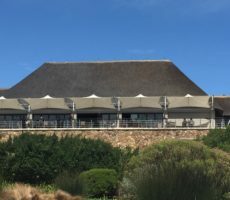 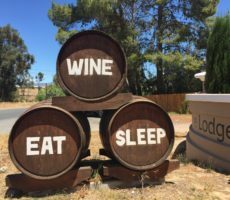 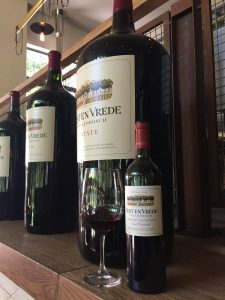 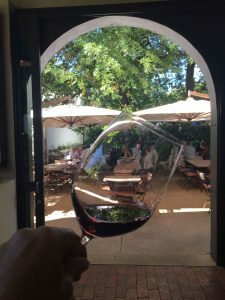 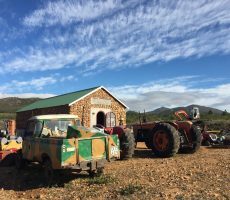 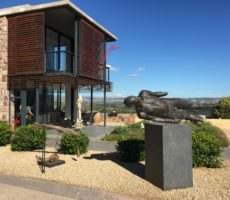 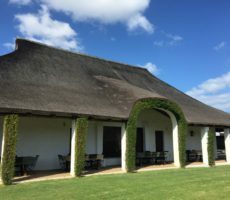 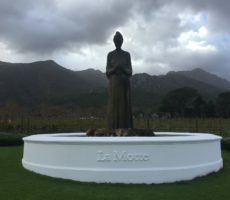 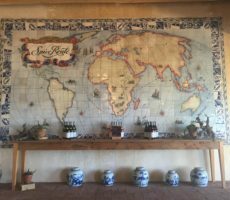 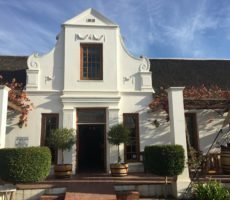 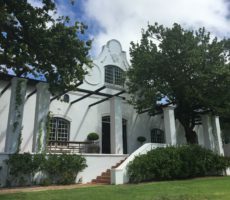 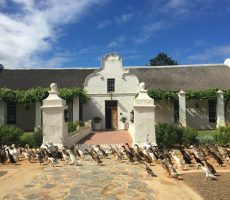 Rust en Vrede is one of those grand old ladies of South African wine estates that just has to be visited if you are a true wine connoisseur, sooner or later. 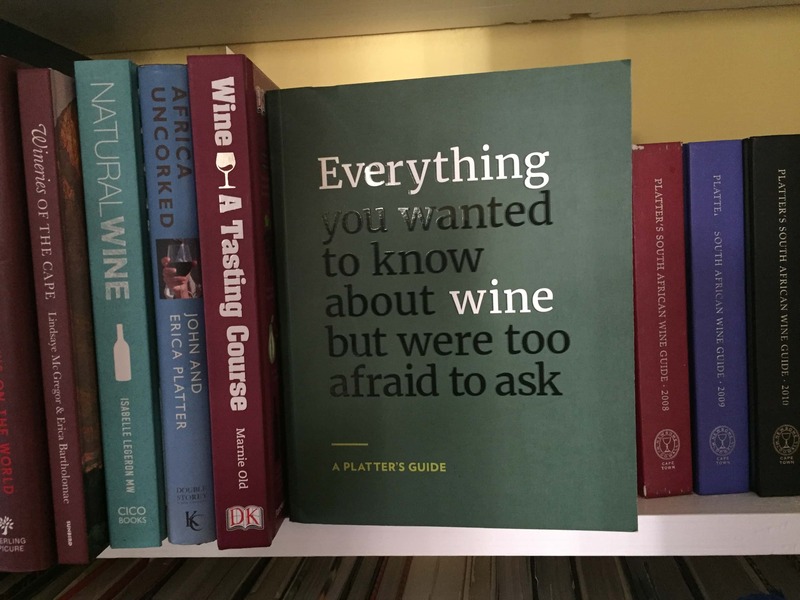 It was later for me and so I was especially looking forwards. 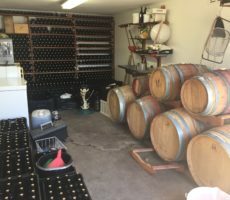 I left Haskell Vineyards and retraced my way back down the Annandale Valley. 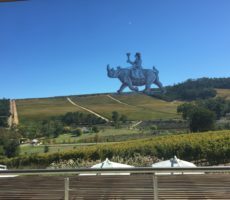 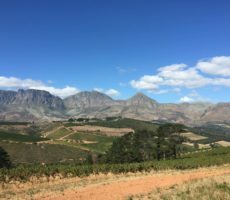 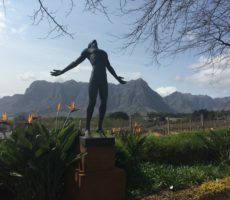 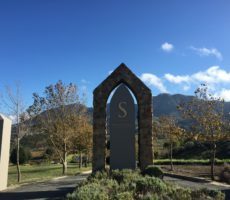 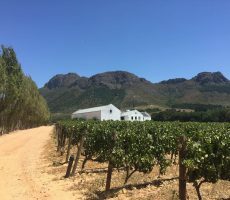 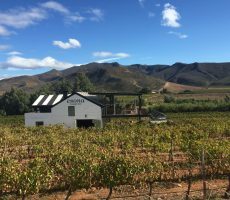 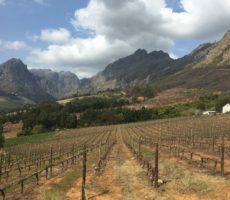 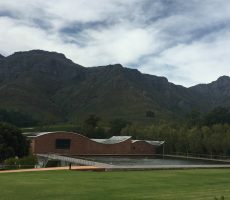 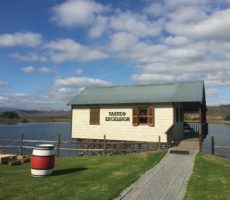 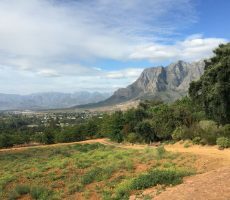 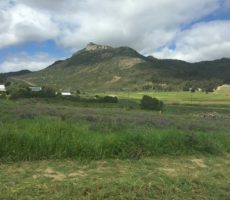 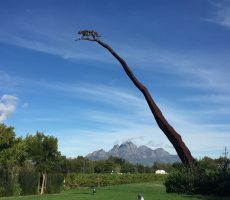 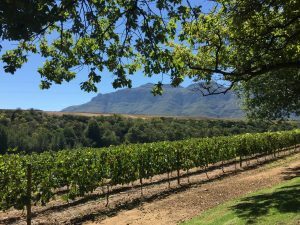 The beauty of the valley alone makes this area to the South of Stellenbosch worth visiting – no wonder it is called the ‘golden triangle’ – let alone the prospect of some classic Stellenbosch Cabernet Sauvignon. 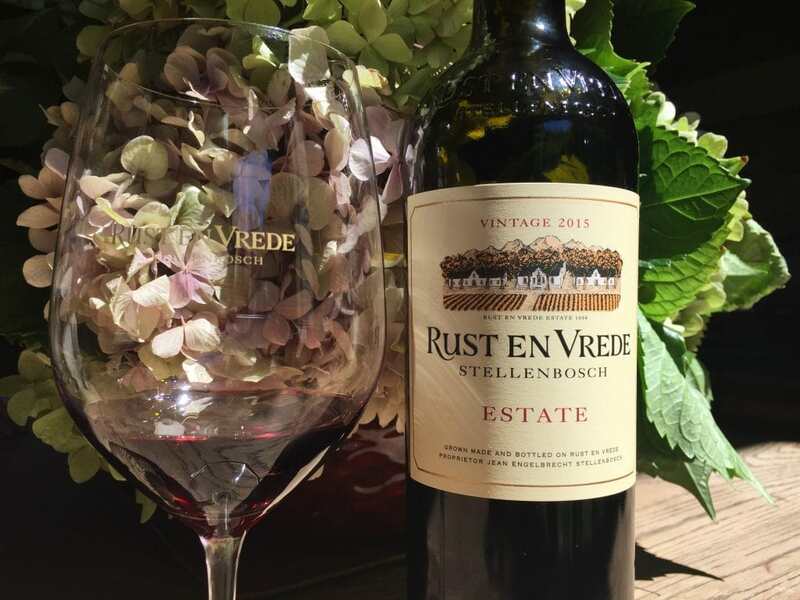 Rust en Vrede, you see, has produced red wines only since the Engelbrecht family bought the estate. 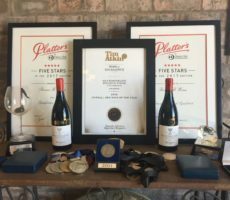 All good reds take time to develop and mature. 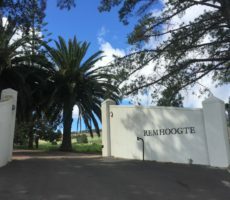 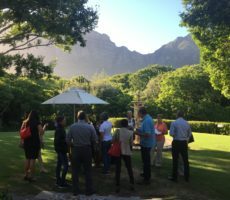 So has Rust en Vrede. 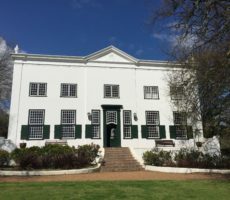 Governor Willem Adriaan van der Stel established the property in 1694. 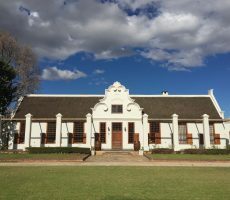 It was not until a hundred years later, from 1780 to 1790, that the first house and the Manor House were built. 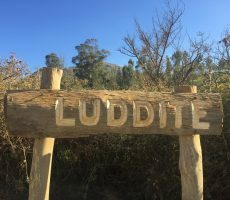 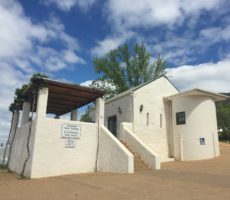 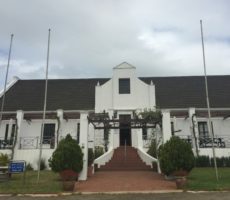 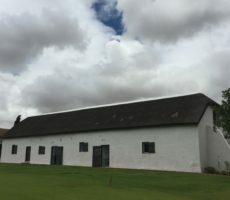 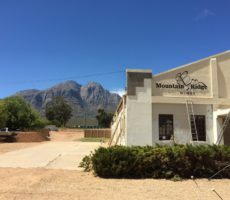 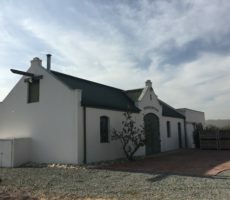 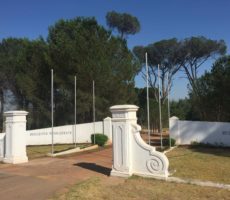 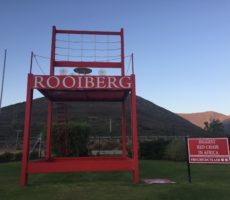 Roll on another 200 years of property division, fire and neglect, until 1977, and to the restoration of the grand old lady by Springbok rugby legend Jannie Engelbrecht. 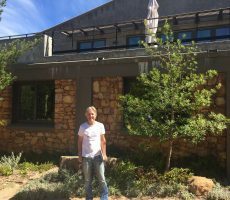 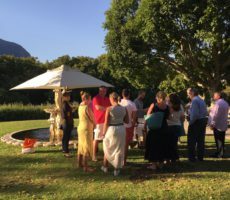 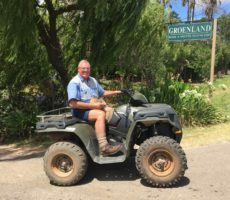 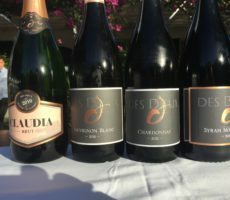 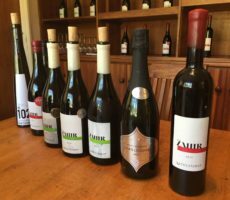 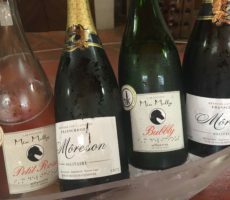 Jannie and his family, including eldest son and current owner Jean who grew up at Rust en Vrede, have certainly done well. 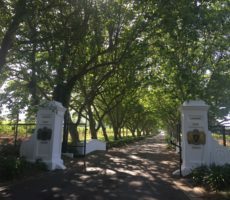 The large white pillars at the entrance, with their gold lettering, offer a statement of permanence and excellence on one’s arrival. 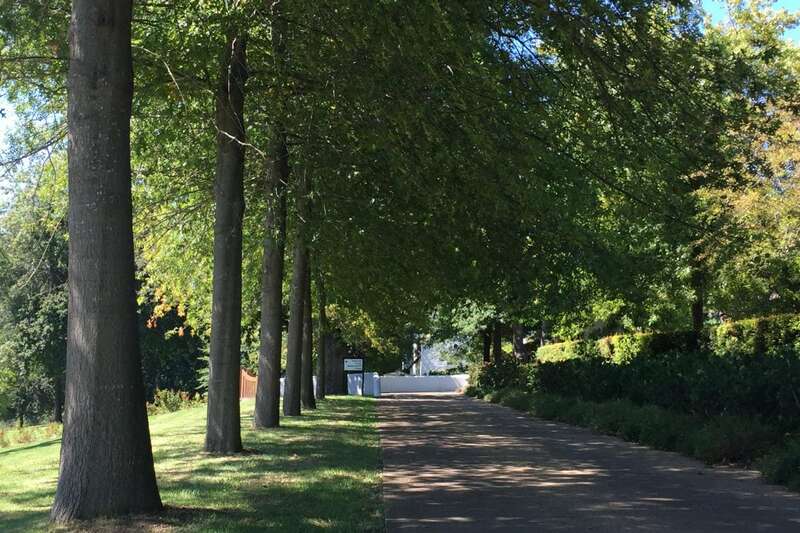 The picturesque setting is enhanced by a tree-lined avenue, with a gentle curve that any budding landscape designer would be proud of. 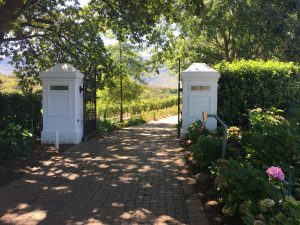 Tidy Syrah flank the driveway at the top of the slope, with Cabernet Sauvignon visible through the trees beyond. 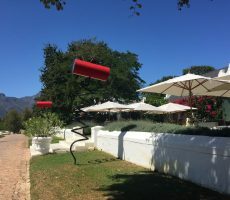 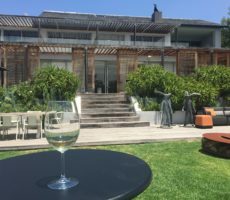 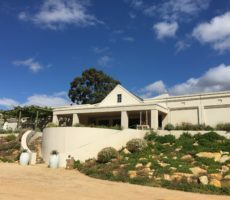 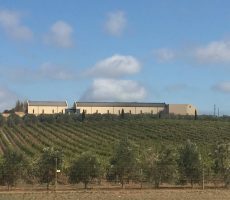 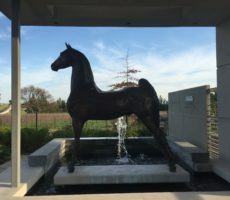 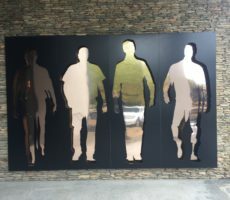 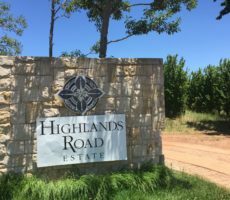 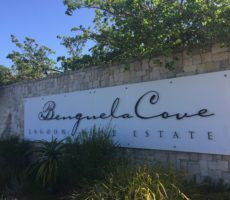 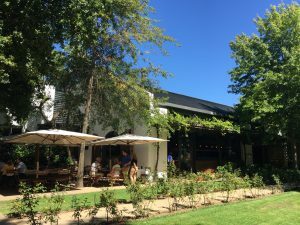 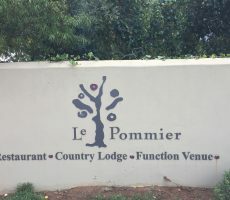 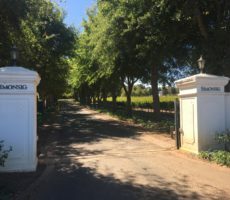 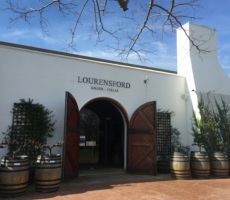 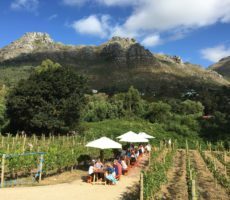 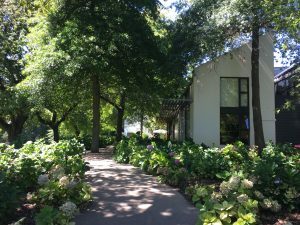 The walk from the car park to the Tasting Room, with world-class Restaurant beyond, is along a shady path lined with manicured hydrangeas, their pink flowers fading a little as if a nod to the old lady. 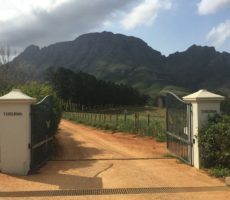 The beauty of the approach reminds me of Delaire Graff. 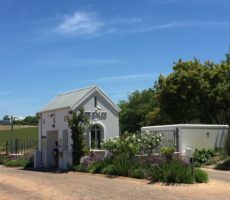 My peace is broken by the busy, long Tasting Room with its impressive display of small to huge wine bottles on one side, opposite the Tasting Counter. 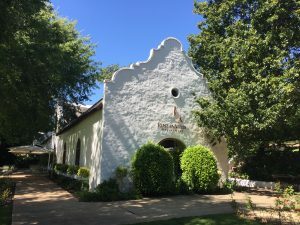 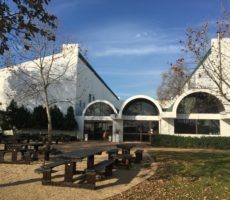 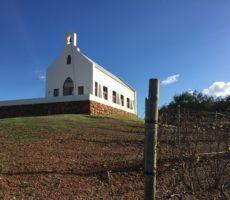 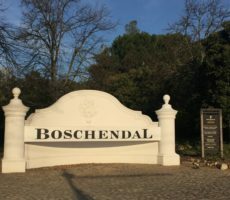 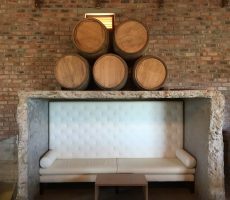 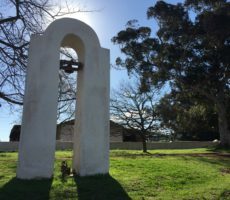 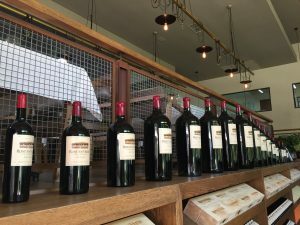 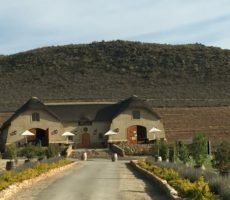 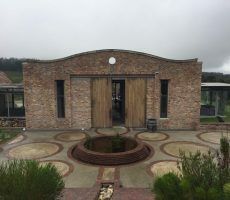 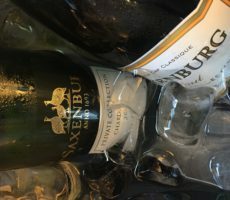 I take a pause to look at the temperature controlled underground cellar – the first to be privately owned in South Africa – with its arched vaults for bottle storage. 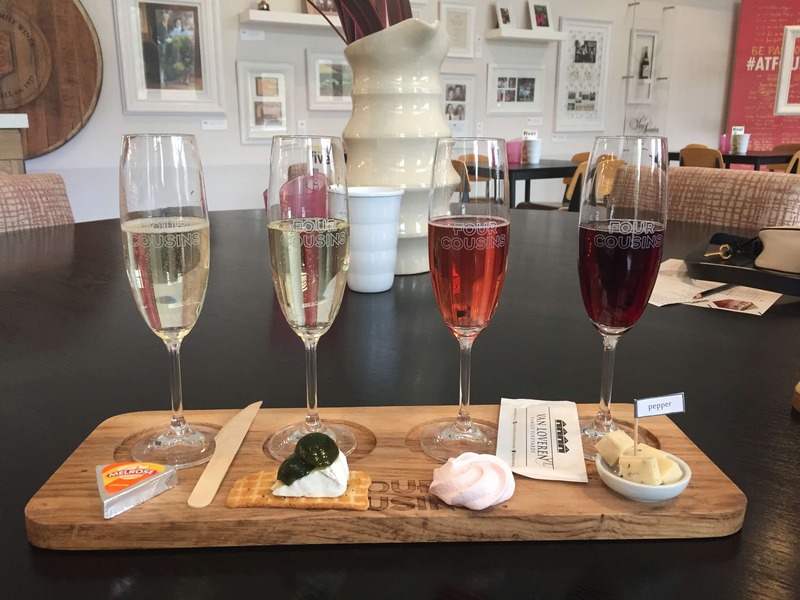 Returning upstairs into the bright and well lit room, I decide to taste at the counter rather than outside where the majority of guests are. 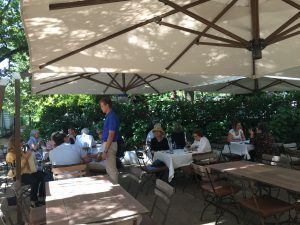 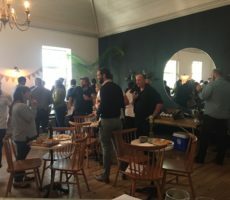 Meanwhile, the light jazz music soothes whilst the many staff – impeccably dressed in tan pants and branded polo shirts (blue for boys and black for girls) – bustle about their business. 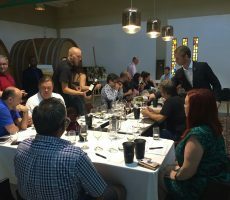 Kesley is my attentive and polite tasting host. 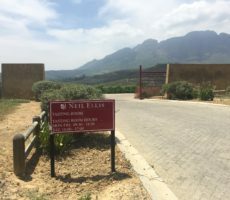 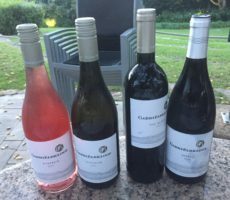 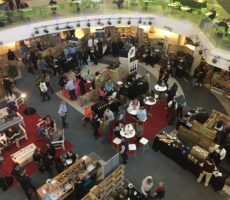 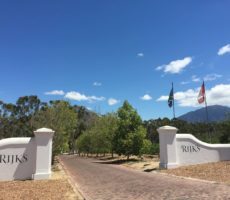 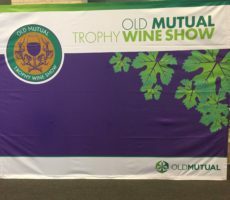 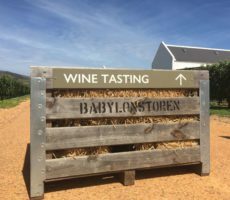 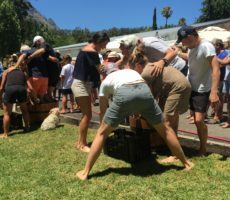 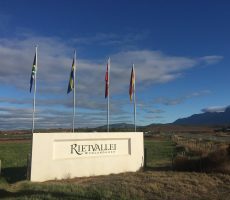 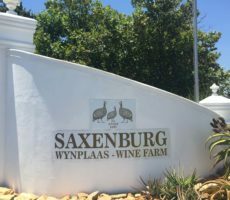 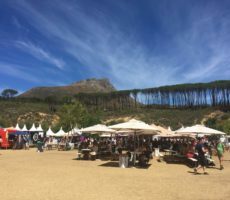 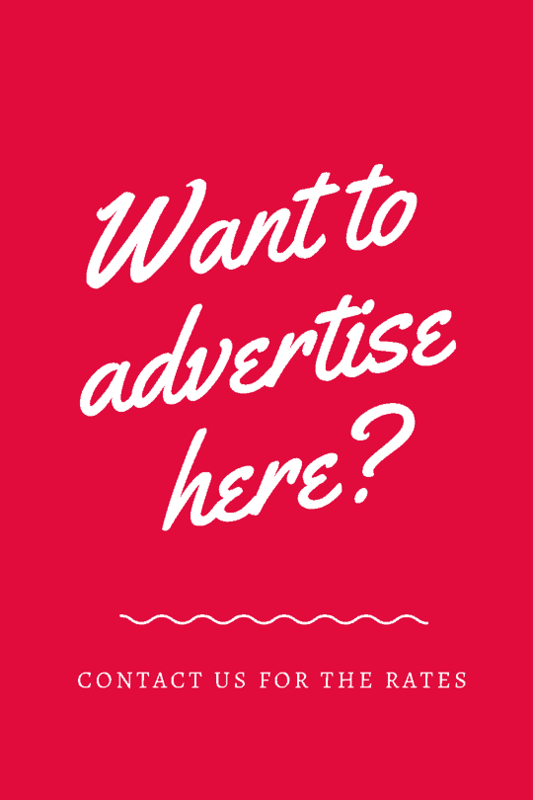 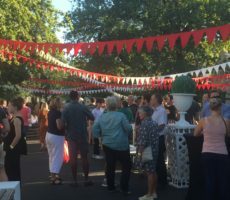 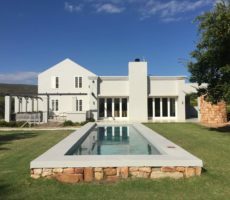 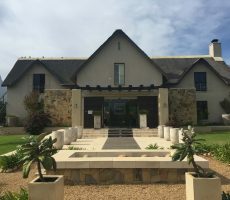 He is a Stellenbosch University student, in his final year studying Actuarial Science, but has quickly built up a good knowledge of the estate and its wines. 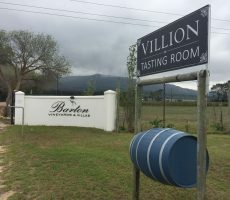 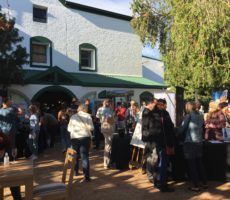 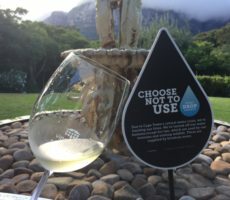 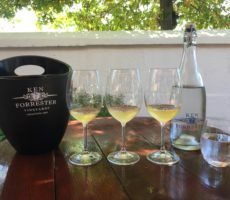 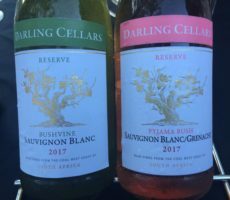 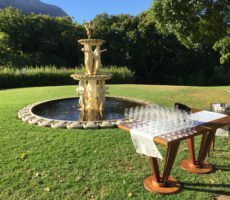 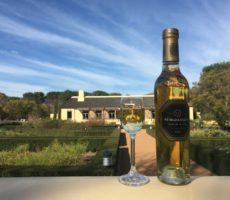 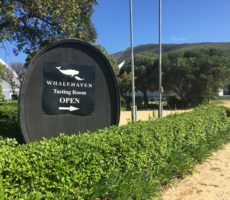 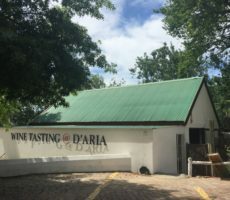 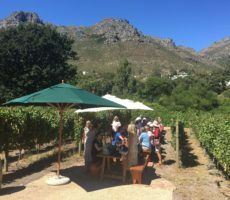 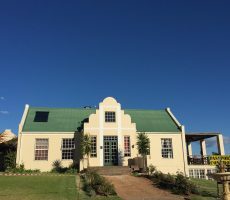 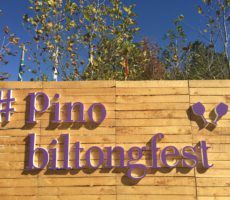 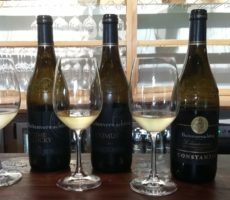 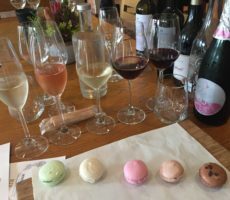 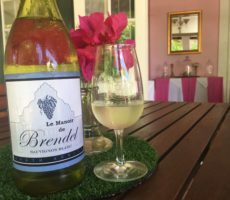 There are 4 tasting options: the Estate Tasting (4 wines for R60); Vertical Tasting (4 of the Estate wine for R120); Single Vineyard Tasting (4 wines for R120); and All Wines (R150). 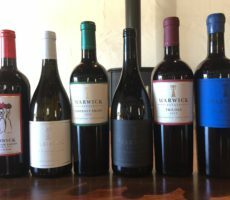 I chose the Estate Tasting. 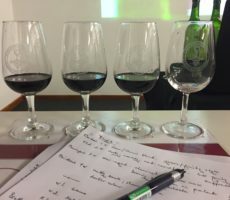 All the wines were served at the right temperature in large red wine glasses. 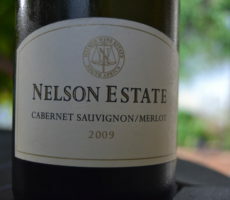 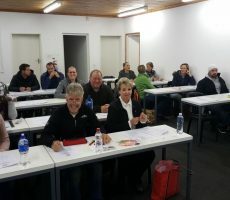 The Merlot was the youngest vintage (2017) and the last single variety vintage to be produced. 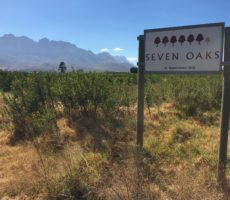 Merlot accounts for 10% of the estate and will in future be used for blending. 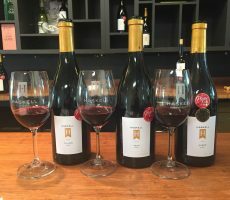 The wine showed great promise from its ruby red, medium-bodied appearance and fresh, vibrant aromas of cherry and spicy plum. 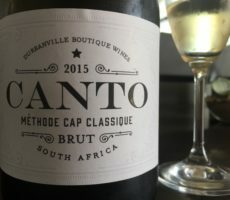 It was let down by tight, bitter tannins on the palate that were too grippy and out of balance with the fruit flavours. 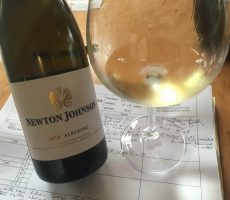 I suspected heavier oaking than the 14 months maturation in 10% new and 90% 2nd/3rd fill French oak but the wine was brashly showing its youth. 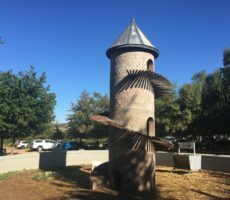 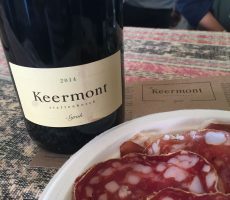 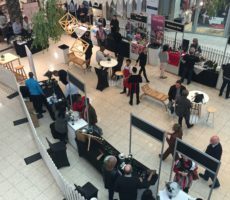 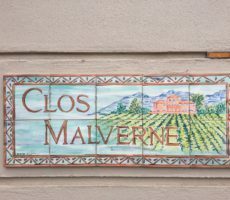 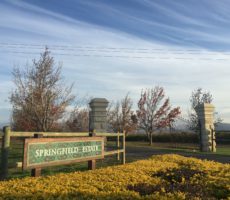 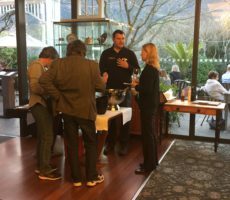 The 2016 Syrah was far better balanced on the palate. 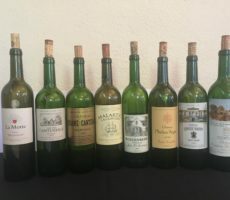 Green tannins showed from the whole bunch fermented grapes, a decision taken due to the drought, but these were less bold. 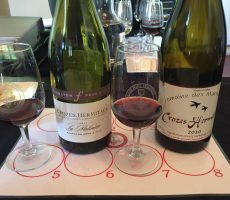 The nose was good too with intense and complex aromas of cassis and other dark fruits, black pepper spiciness and a smoky, savoury bouquet. 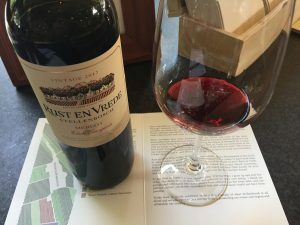 Kesley also let me taste the 2014 vintage. 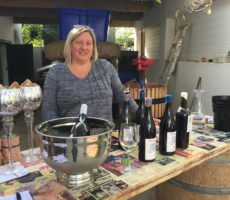 It was my favourite wine. 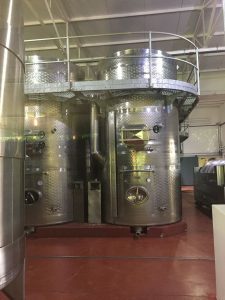 Like its younger sibling, the wine was matured in 500 litre barrels for 18 months in 33% new French oak. 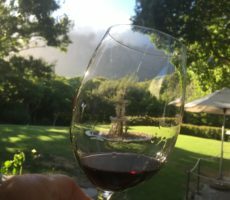 The wine was less smoky but fruitier with a greater complexity of mulberry, cherry, blackberry, cassis and black pepper aromas. 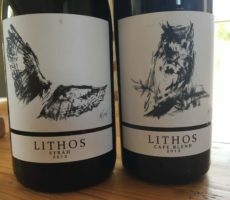 The balance between fruit and tannin was best of all to show elegance, poise and power. 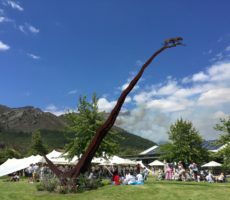 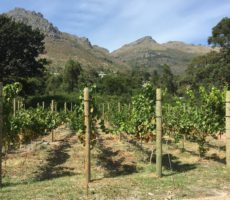 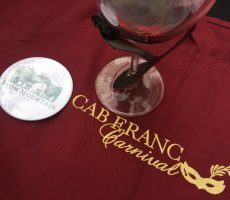 Cabernet Sauvignon is the most planted vine (60%) which, like the Merlot and Syrah is planted at 85 to 130 metres above sea level on the lower Helderberg Mountain slopes. 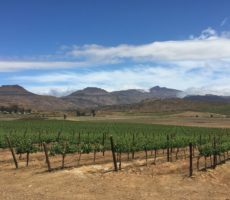 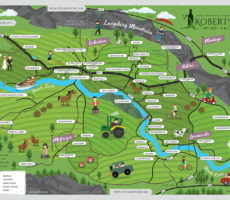 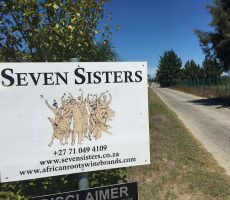 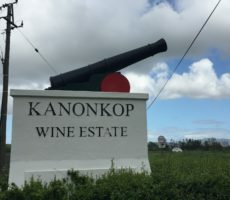 The vines are planted on 34 hectares of the 50 hectare property and face mostly North (North-East to North-West) to catch the sun for ripening and to shield them from the prevailing South-East wind. 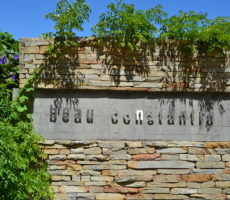 The decomposed granite and sandstone soils give structure and power to the wines. 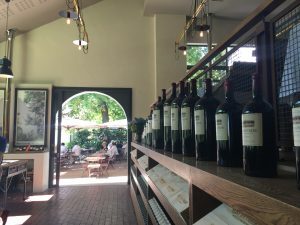 The wine was a classic Stellenbosch Cabernet Sauvignon and very clearly a South African wine. 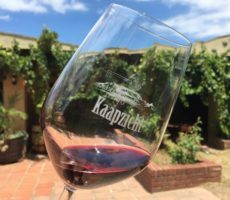 I needed a fresh glass to taste fully as I picked up Syrah spiciness on first pouring. 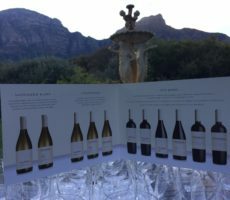 The wine did everything it should. 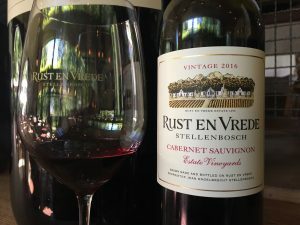 The nose showed a good intensity of bramble, cassis and black plum fruitiness with an underlay of green herbs, whilst the palate offered grippy but tight tannins. 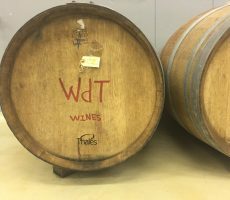 The ageing régime was the same as for the Syrah except for 300 litre barrels. 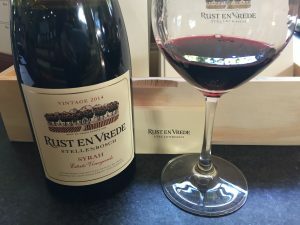 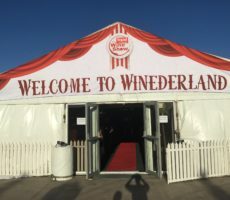 Like the Syrah of the same vintage, the wine showed its youth and needs a good 5-10 years for the tannins to open and soften for a smoother experience. 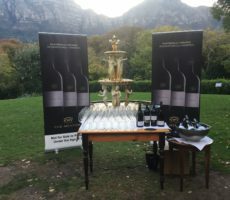 The final wine of the tasting was The Estate. 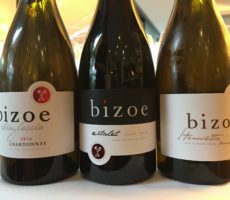 The simple name for the flagship wine showed the assured confidence of the old lady herself. 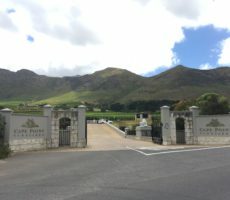 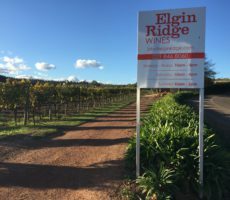 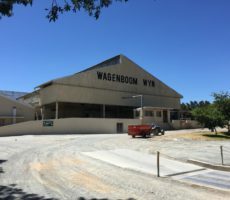 The 2015 vintage, one of the very best in recent years due to near perfect growing conditions, was the youngest on offer. 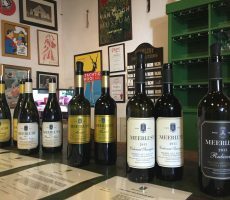 Wesley explained that it was the first South African wine to rank in the World Top 100 wines by Wine Spectator. 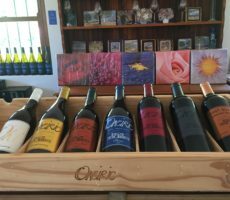 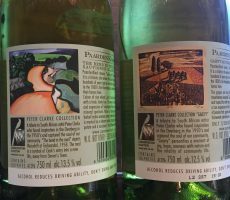 The wine has been made for 30 years. 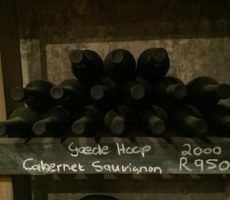 It is always blended close to 60% Cabernet Sauvignon, 30% Syrah and 10% Merlot (see below for precise amount for this vintage). 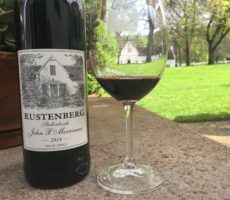 This was a rich, powerful wine with a heady 14.6% alcohol to match the heady price (R450, rising to R750 for the 2012 vintage). 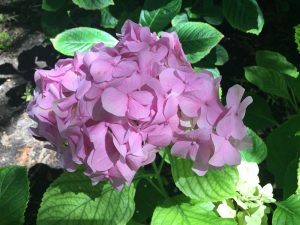 The nose intrigued as it contradicted. 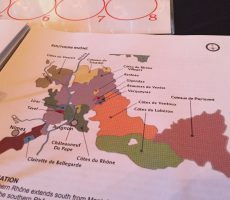 There was obvious complexity of aromas due to the contribution from each of the 3 cultivars – savoury red and dark fruits from the Cabernet Sauvignon, peppery spicy dark fruits from the Syrah, and sweeter red fruits from the Merlot – but I struggled to pick out the individual notes on the nose. 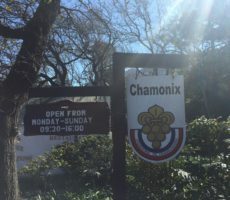 It was a paradox I did not fully resolve. 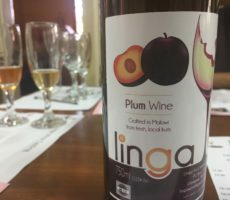 The palate was much as I expected. 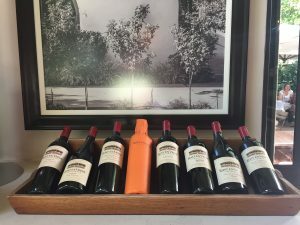 The boldness of the fruits matched the structure and intensity of the tannins. 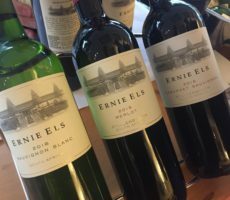 The Estate is a definite food wine and deserving of long ageing. 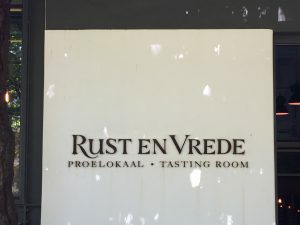 I learned after that Rust en Vrede means ‘rest and peace’. 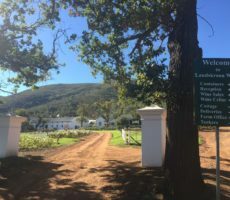 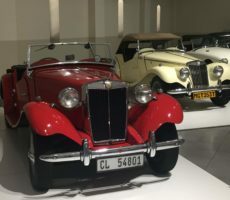 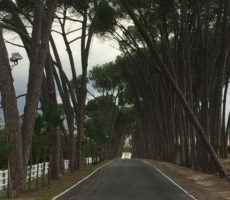 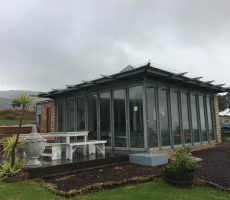 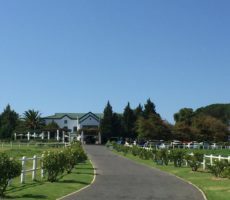 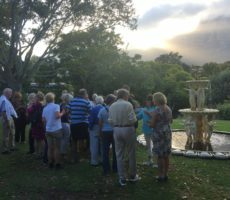 The peace of the estate, its tranquil setting, immaculate gardens and historic buildings, and the beautiful surrounds was immediately obvious from my arrival in the car park that was filled only with Mercedes, Audi and BMW cars. 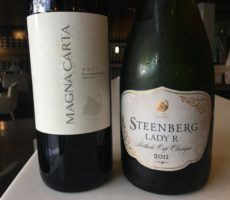 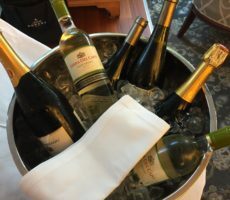 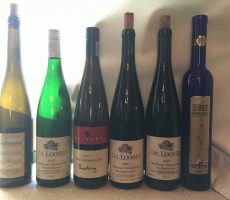 The premium pricing for the wines thus did not surprise. 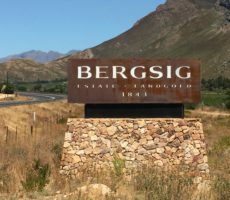 The Engelbrecht family, however, have hardly rested. 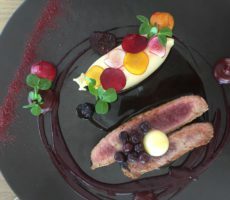 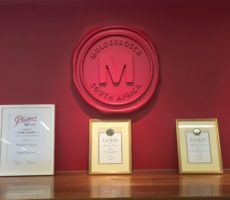 Rust en Vrede has won many accolades in the last 40 years. 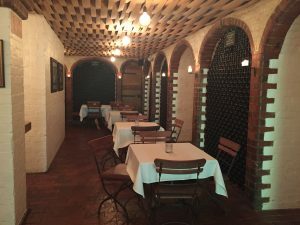 I mentioned the first temperature-controlled underground cellar in private ownership. 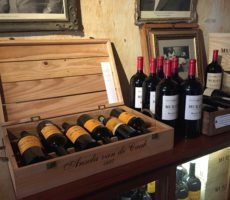 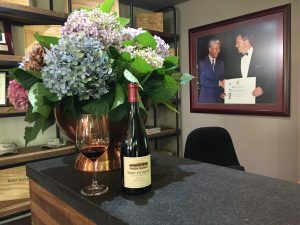 Nelson Mandela chose a Rust en Vrede wine at his Nobel Peace Prize lunch. 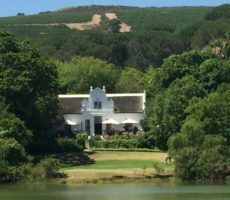 The wines and the Restaurant have featured multiple times in Top 100 lists in the world. 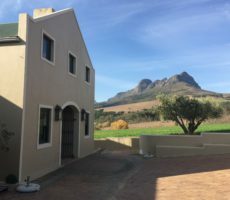 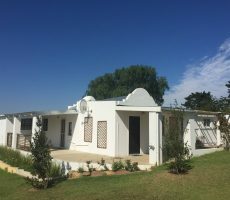 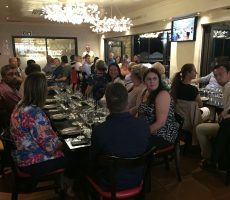 Jean Engelbrecht has taken on trusteeship of the property and risen to the challenge which, in his own words, is ‘not just to maintain it – that is your responsibility – but to build on it’. 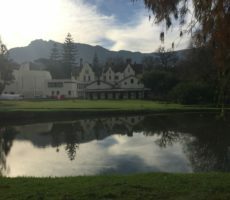 The rest and peace balance well.